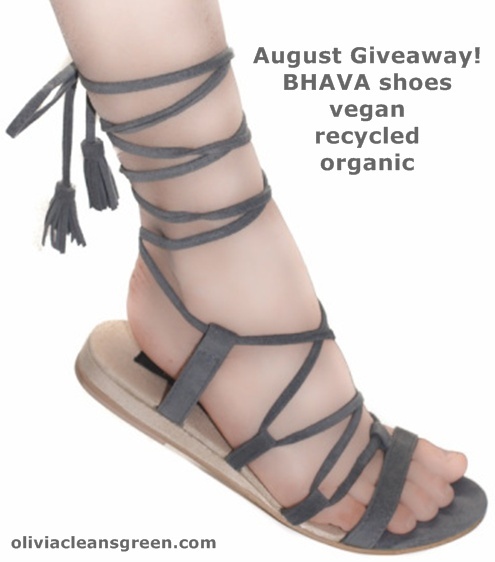 Olivia Cleans Green: Interview & Giveaway: BHAVA Vegan, Organic Shoes! I've partnered with BHAVA studio to host an awesome giveaway: this pair of designer cruelty-free shoes made with recycled and organic materials! You can enter today through August 31st using the widget at the bottom of this post. First, check out my interview with designer Francisca Pineda, the co-founder of Bhava. Bhava is often translated as a feeling, or emotion, in sanskrit, turns out this was a great match for the reaction we get from those who first see our collection. What inspired you to start a vegan shoe company? This is very personal. The reasons are too many to mention, but I personally witnessed the disabling effects of the toxic chemicals used in the majority of leather production. In addition, after taking an Ethical Fashion class in FIT I learned the disastrous effects of our decisions as designers and consumers. I made a personal promise to myself to make a change, the thought of profiting from such a destructive system was no longer an option for me. I believe we all have different callings, we are all drawn to our unique causes and experiences. Can you talk a little bit about the organic and recycled materials you work with? We are as sustainable with every component of our shoes as possible, from the Japanese 100% recycled breathable ultrasuede outer, to its durability, to our hand woven cotton and reclaimed wood heels. Bhava is also proud to support organic farming practices by purchasing from suppliers we know care about our environment as much as we do. Our organic cotton lining supplier uses ayurvedic herbs for the natural and sustainable dying process of the fabrics. I love the idea of supporting ancient and time tested medicinal practices through fashion. I live every aspect of my life as naturally as possible, from organic make-up to and natural oils to everything I eat. It wasn’t until the last few years that I realized how important what we wear and the business practices we support are to our planet and its inhabitants. What's your favorite way to wear Bhava shoes? All our shoes are my favorites but I love how versatile the Tyler wedge has turned out to be. They look great casual with shorts or with an organic cotton dress like the one I'm wearing here by Tara St. James. Okay, now for the giveaway. I hope you'll enter and tell your friends! Carmen sandal comes in 3 colors: grey, sunset, and teal. Winner picks color and size (whole sizes 6-10). So glad to have found your giveaway Olivia! Clicked on some ads too! I never wear sandals, really but these just knocked me off my chair! thanks :-). they are pretty special shoes. Welcome to OCG! Hope you'll visit again.